Father Paul MacNeil is one of those lucky individuals who has two countries to call home, and even luckier to be well-loved in both. 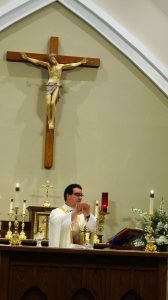 The administrator of St. Peter Church recently celebrated his 25th jubilee here, in his home away from home. In June, he will return to his native Diocese of Antigonish, Nova Scotia, Canada, for another celebration. Father MacNeil said he originally considered applying to a diocese in Florida, but was convinced by Msgr. Cellini that the climate and culture were both better in South Carolina. So he received permission from his bishop to spend a couple of years here. “A couple of years turned into incardination,” Father MacNeil said with a laugh. He adds that receiving the letter from Bishop Robert E. Guglielmone asking him to be a priest of the diocese is one of the highlights of his vocation. 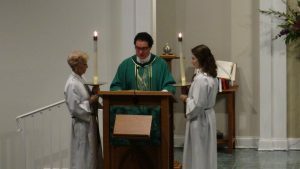 When he first arrived in South Carolina, he was appointed parochial vicar at St. Gregory the Great, Father MacNeil said, and has served as an administrator at St. Peter for the past three years. The southern Lowcountry that he calls home now is a bit warmer than his native Nova Scotia, where summer temperatures reach the low 80s, and winter can drop to 16 degrees. He recalls his childhood warmly, noting that he came from a close-knit Catholic family where he was the youngest of six children. They attended public school but were active in the church. “My faith was always strong in my life, but particularly in junior and senior high with the youth group, when I had an amazing growth in faith,” he said. It wasn’t until his second year of college when he was praying one night, that he first thought about the priesthood, he said. At that point, a warm feeling of peace flowed over him. “It was like God giving me a big hug,” Father MacNeil explained. From there he spent a lot of time in discernment, speaking with priests and his former youth leader, Sister of Charity Catherine Steele. He was 20 when he was first accepted by his bishop and entered the seminary at Augustine’s in Toronto, Ontario. 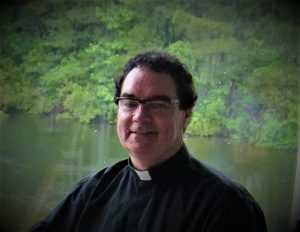 The priest spent 18 years serving in Canada, the bulk of it as a chaplain at St. Francis Xavier University in Antigonish. 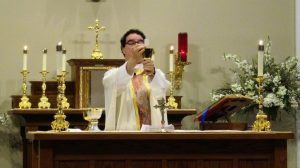 It was during a sabbatical at the North American College that he first became friends with many American priests, leading to visits here and a call to serve. He said the local priests and people are friendly, polite and faith-filled. Some of his best memories include his first Easter service at an outdoor Mass at Sun City in Bluffton, and meeting the wonderful people of St. Peter.